Search Solutions is a special one-day event dedicated to the latest innovations in web & enterprise search. In contrast to other major industry events, Search Solutions aims to be highly interactive and collegial, with attendance limited to 60 delegates. The high quality technical programme includes presentations, panels and case studies in which delegates present and share opinions, insight and expertise. The event should appeal to researchers, practitioners, consultants, end users or indeed anyone interested in the latest developments in web and enterprise search. The event will also be followed by the IRSG AGM (timing TBD). Note that there is no on-site registration. Not sure if I mentioned this before (I probably did in the last issue of Informer), but on April 1st next year Mike Taylor, Udo Kruschwitz and I will be organising an Industry Day at ECIR 2010. This event is similar in spirit to the Industry Track at SIGIR (which this year was chaired by my ex-Endeca colleague Daniel Tunkelang), but with a more European focus. The venue is the Open University campus in Milton Keynes, UK. In common with previous IRSG Industry Days, we aim to present a topical selection of talks, panels and case studies from the world of search and information access, with the emphasis on content drawn from the IR practitioner community. We won’t be issuing a “call for papers” as such, as this is essentially a ‘by-invitation’ event. However, if there are individuals or organisations out there who’d like to get involved (e.g. as panellists or speakers) and have an interesting case study or demo to present, then drop me a note either here or offline. As in previous years, we aim to present a topical selection of the latest innovations in search and information access, whilst maintaining the collegiate spirit of what we like to think of as a community event. (As an example have a look at last year’s programme: http://irsg.bcs.org/SearchSolutions/2008/sse2008.php ). We won’t be issuing a “call for papers” as such, but if there are folks out there who’d like to get involved (e.g. as panellists or speakers) and have an interesting case study or demo to present, then drop us a line at the address below. Industry News, Featured Jobs, Contacts, etc. Informer is free to download from the IRSG website. Enjoy! Last Thursday I had the pleasure of co-organising & presenting at Search Solutions 2009, at BCS HQ in Covent Garden. Here are some of my highlights & reflections on the day. These days there area great many events to choose from if you want to find out about the latest innovations in search and information access. But what makes Search Solutions different is that it provides an informal, interactive alternative to the highly choreographed, glossy brochure, convention hall style of conference that seems to dominate the search industry. Search Solutions is a much smaller, more intimate event, structured so that it is possible to meet just about all the speakers and delegates during the course of the day. In addition, the focus is firmly on the presentation of original material with credible technical content, rather than ‘sales pitches’ that contain no element of self-critique or realistic objective evaluation. In common with previous years, this year’s event attracted an eclectic mix of speakers drawn from global organisations, start ups and solo players in the world of web & enterprise search. We were privileged to have BCS President Alan Pollard formally open the proceedings with an overview of the Society’s ambitious plans to reposition itself as the “Chartered Institute for IT”, providing an overarching certification body for all the specialist professions within the field. The technical programme was kicked off by Mike Taylor, who presented a overview of some of the techniques that have been used for learning ranking functions at Microsoft Research. It had been a while since I’d seen anyone provide serious mathematical analysis in a ppt presentation, but Mike more than made up for this, giving us enough equations in 20 mins to last a fair few conferences to come. This was followed by Vivian Lin Dufour, who presented details of Yahoo’s progress in developing an interactive search assistant known as Search Pad. The idea of this app is to detect when users are engaging in research activity and support them with automated tracking, authoring and annotation tools. I think it’s a great idea, although not entirely unprecedented (the idea of automatically detecting and reacting to human behaviour has been a popular theme of AI and HCI research for many years). To me the hard part is reliably detecting the patterns of behaviour and defining what those patterns mean in the first place, as well as finding an appropriate balance between user control and system initiative (which will inevitably vary by user, task and context). Rounding off the opening session was Richard Russell from Google, who presented a highly entertaining overview of how Google ads work and the ecosystem that supports them. The afternoon session was opened by Greg Grefenstette of Exalead, who presented his thoughts on the intersection of database and search engine technology, and how the two can be combined to create “search based applications”. These provide a unified view of structured and unstructured data, updated in real time and accessible via a familiar search UI (a value proposition not entirely dissimilar to Endeca). One key difference however would appear to be in the emphasis on user experience: the Exalead position seems to be that UX is more of a ‘hygiene factor’, indigenous to the platform itself, and that end users will simply configure the UI however they see fit. But I find it hard to believe that this approach would scale for all but the simplest of applications –I have seen too many examples of poor usability to believe that good design will happen as a fortuitous by-product of end user configuration. Of course, this may all be a matter of interpretation – if you define the scope of UX as starting with query formulation and ending with results presentation, then fair enough; it probably is relatively trivial. But if you define UX that way then you probably have also missed the point. One of the most memorable talks in the afternoon session was from Richard Boulton, who described his experiences in developing a web service interface to IR code library Xapian. This could have been a relatively dry topic, but was brought it to life by Richard’s personal anecdotes of the eccentric away days and bootcamps he attended in developing the system. The proceedings ended with a panel session on Interactive IR, picking up on the threads that had been generated on the IR mailing list around the subject of the “Google Generation” and the how the information seekers of the future deserve something more than simply a further extension to the best-first ranked results paradigm. The discussion that ensued extended far beyond the original theme, with many delegates joining in to offer their views of how the world’s information might be organised in the future. The day closed with a drinks reception in the atrium and the IRSG AGM, at which I’m pleased to say many new delegates came forward to serve on the IRSG committee for the forthcoming year. If you’re similarly inspired and interested in joining them, drop me a line. We’re particularly interested in building stronger links with the IR practitioner community. Next year’s Search Solutions will again be held at BCS HQ in late October (date TBC). We’ll be starting the formal planning early in 2010 so if you’d like to be involved just drop me a line either here or at irsg@bcs DOT org. In the meantime, we are hoping to run an Industry Day at ECIR 2010, in Milton Keynes on April 1st. Watch this space for updates! A while ago I posted out the full line-up for Search Solutions 2009, to be held at BCS London on October 1st. But one thing that we hadn’t finalised then was the panel – that was still very much a TBD, with at least two candidate topics under consideration. So I’m pleased to now confirm that the theme for this year’s panel will be “Interactive Information Retrieval”. It’s a subject close to my heart, and one that is receiving increasing amounts of attention through events such as the HCIR conference series and dedicated columns within UX web magazines such as UXmatters, in addition to growing interest and awareness within the UX and IR communities more generally. The details for the panel are attached below. I’d like to acknowledge Leonard Will as the (somewhat unwitting) inspiration for this, with his thought provoking observations on the talks given at the BCS event “Search – the Science Making Tomorrow’s World” earlier this year. Actually, on reflection, the title “Interactive Information Retrieval” isn’t ideal, as it’s a bit generic and doesn’t quite capture the essence of the specific themes alluded to in the abstract. So if you can think of a shorter, better, or more pithy title, please let us know! It has been widely reported that the “Google Generation” is changing our expectations of online information-seeking behaviour, and that impatience in search and navigation and zero tolerance for delay in satisfying information needs are becoming the norm. But should simple keyword search remain the dominant paradigm for information seeking behaviour in the future? Should we not be encouraging users to employ more sophisticated search techniques than simply entering keywords and relying on best-first ranked retrieval algorithms? What prospects are there for developing a more meaningful interaction with end users, providing a constructive dialogue that supports and facilitates search and information discovery in its widest sense? On September 4th my Endeca colleague Mark Burrell & I are presenting a tutorial at HCI 2009 called “Designing Effective Search & Discovery User Experiences“. This half-day tutorial provides a practical introduction to Human Centred Design for information search, access and discovery. We present a concise overview of the “Design for Discovery” framework and show how this can be applied to the design of search user interfaces. A key element of the tutorial is the opportunity to apply these skills in a practical group exercise. The cost for this tutorial is just £40, which by most people’s standards is extremely competitive. It certainly compares very favourably with the typical price for commercial user experience training courses, e.g. this one which costs £675 + VAT for 2 days, or this one which costs 425 + VAT for just one day (in fact, I used to teach the first of these two courses). Note that attendees not have to register for the main conference event, i.e. you can attend just the tutorials alone. See the HCI 2009 conference website for further details. For convenience I’ve included the official blurb below. This half-day tutorial provides a practical introduction to Human Centred Design for information search, access and discovery. 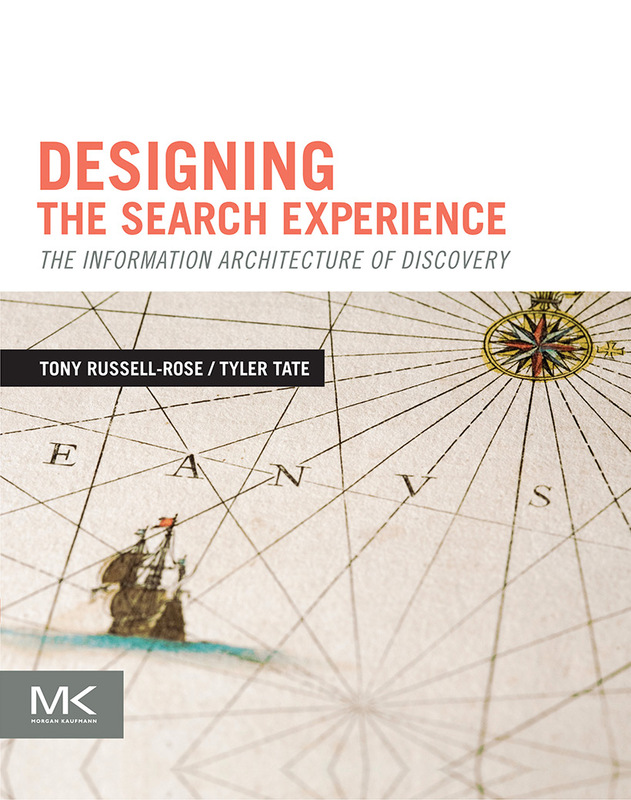 We present a concise overview of the “Design for Discovery” framework and show how to apply this to the design of search user interfaces. A key element of the tutorial is the opportunity to apply these skills in a practical group exercise. Web designers, information architects, user experience architects, and HCI professionals and researchers interested in the designing more effective user interfaces for search and information access. No specialist skills or knowledge are required. Tony Russell-Rose is User Experience Manager at Endeca Technologies, an enterprise software company specialising in innovative solutions for information search and discovery. Before joining Endeca, Tony was founder and director of UXLabs, a user experience consultancy specialising in technology innovation and applied R&D. Prior to this he was R&D group manager at Canon Research Centre Europe and technical lead at Reuters, specialising in advanced user interfaces for information access and search. He holds a PhD in HCI and a first degree in engineering, majoring in human factors. Tony is also Honorary Visiting Fellow at the Centre for Interactive Systems Research, City University London. Mark Burrell is Worldwide Lead for User Experience at Endeca Technologies. He has over 25 years of professional experience, including 15 years focused on the evaluation, design, and adoption of interactive technology solutions (with special emphasis on applications that aim to support learning and discovery). Prior to joining Endeca, Mark built and led user experience teams at several leading product and service companies including serving as Sr. UX Manager for Microsoft’s Unified Communications product division and Global UX Lead for Sapient. Mark holds a PhD in Clinical psychology with concentrations in cognitive psychology and epistemology/philosophy of science.